I am not a big club guy. I don’t (can’t) dance. I don’t particularly even like loud music at the bar. The whole idea of “going hard” late into the night while the beat bumps doesn’t intrigue me that much. So, normally, I pass on the high cover charges and the VIP velvet ropes. However, while on our honeymoon we made one exception. Early on during our stay in Cancun we met a couple of fellow honeymooners at the pool. We hit it off with them right away as they were our age and the girl was even a second grade teacher just like Sid. While in the pool, a couple of young guys promoting a club called Coco Bongo came around. Our new friends had heard of the particular venue and were all about going. They tried to persuade us to go but we passed at that particular moment. I trusted this couple and thought it might be worth it to give the place a try. The next day, Sid and I went to downtown Cancun. While we were hitting up the shops and flea market, we saw the Coco Bongo venue. It looked spectacular as the exterior was uniquely decorated with a large Spiderman sculpture dominating the entrance. Signs from a CNN news story headline saying that Coco Bongo “Puts Las Vegas Nightlife to Shame” were in full view. 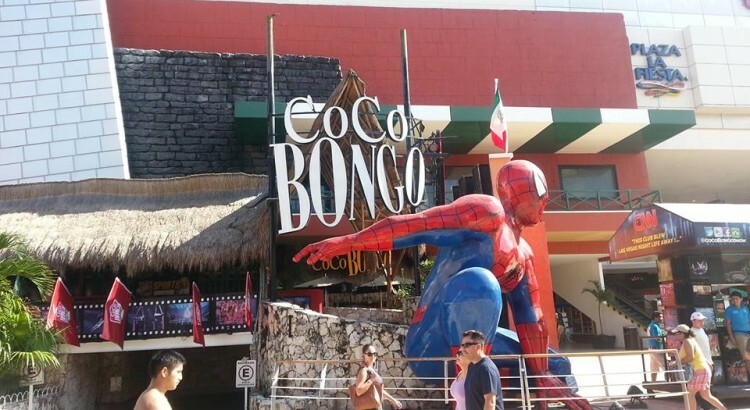 This is Coco Bongo from the outside (photo credit to http://totaltravelblog.co.uk). I went up to one of the several guys out front selling tickets. After a short discussion, I bit the bullet and purchased $70 passes for Sidney and myself. To celebrate, the guy bought us a round of drinks and presented us a gift bag with t-shirts. Sid and I suddenly had big plans for the evening! Later that night we ventured back out to downtown Cancun. When we arrived at Coco Bongo, it was a chaotic scene outside. Lines of people went in several directions, traffic was heavy, and about 20 Spiderman and Beetlejuice impersonators were working the crowds trying to get club goers to take photos with them. We found a line that matched our wrist band we had purchased and were quickly ushered inside. 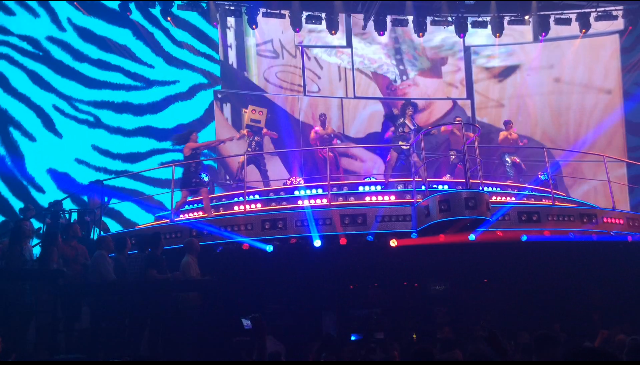 Okay, at this point I should explain what Coco Bongo is all about. The concept of this place can be summed up as follows: live concert meets Cirque de Soleil meets the coolest club you could ever imagine. High quality celebrity impersonators and acrobats/performers put on a spectacular show while you dance, drink, and enjoy yourself. I only took a couple photos when we were in Coco Bongo and they are all grainy. However, this is one of Sid and I. The club was insane. When we got inside, we were taken through a maze. We didn’t know what direction we were going other than we were ascending up. At every corner they had shots and drinks that you could just grab. After maneuvering through the maze and security, we went through one final door and into the club which was actually more of an arena. Before we could really register the spectacle that was surrounding us, security took the two of us and escorted Sid and I right up front to where an elevated stage was. Underneath the stage at eye level with us was a bar. Directly behind us a few feet was another stage. People surrounded us pretty much shoulder to shoulder and two levels of seats ran around the outside of the area. All the seats were packed and all those people were looking down at us. It didn’t take me long to figure out this was a type of club I had only seen in the movies. Confetti blasted out constantly from large tubes elevated above us. Balloons were dropped. Cold air was released upon us. Bubbles appeared. It was absolutely wild. Coco Bongo had Cirque du Soleil type performers who would do their thing right in the middle of everything. It was an open bar and because of the package we had purchased, it was easy and painless to get a drink. Combine that with the fact that the bar was only a few feet away from us and you probably get the idea that we never went thirsty. But the awesome club atmosphere and the free drinks couldn’t hold a candle to the best part: the entertainment! We watched front row as acts such as Queen, Bruno Mars, Moulin Rouge (Lil’ Kim, Mya, Pink, Christina Aguliera), LMFAO and Madonna put on fun and energetic performances. In between acts, they would play the best dance mix ever while projecting the music videos for each song on their giant, crystal clear video board. Often the music videos would cut out and a live stream of the crowd would cut in. They would zoom in on different people and it was just pure fun. I took this photo after Sid and I took bathroom breaks. This was towards the end of our night when LMFAO was on stage. But they had more than just singers. They had Beetlejuice and a mini Beetlejuice do a number. They had a couple of Cirque de Soleil inspired acts where performers would take over the stage behind us and do crazy things on ropes and bars. In one incredible instance, they had a Tron act where probably 30 actors in full robot gear came out and dazzled. They had people on stilts, they had people in masks. It was nuts. For a guy who doesn’t like clubs, I enjoyed myself for almost four hours that night. I (tried to) dance and had a great time with my wife. I could tell just by looking at her that she was having the time of her life and that made my time in Coco Bongo even better. As we reached that four hour mark we both looked at each other and knew that it was probably time to go. The party would go on well past 3 a.m. but leaving at 1 a.m. was just fine with us. We were let out and took an elevator back to the chaotic downtown Cancun reality. We jumped in a cab and went back to our resort with the memories of a truly great club experience. Don’t Blink. 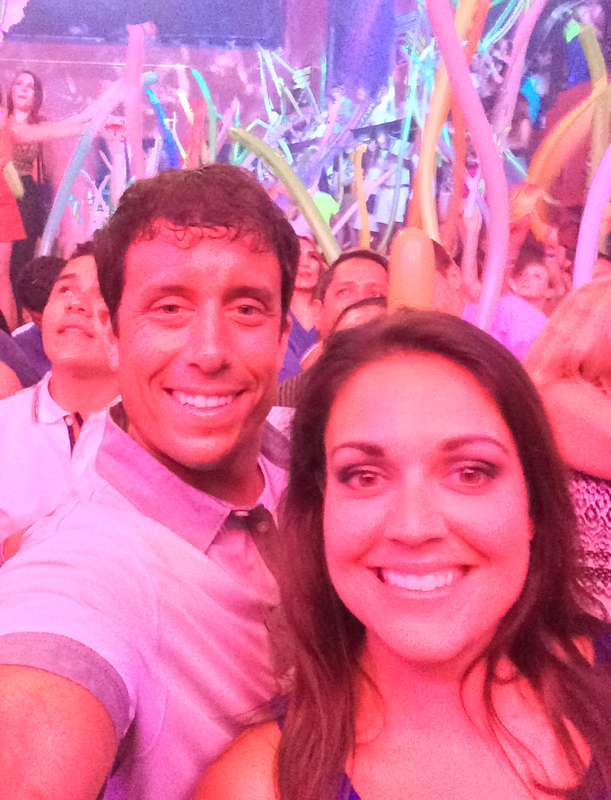 This entry was posted in Uncategorized and tagged Cancun, clubs, Coco Bongo, Coco Bongo Cancun by brent. Bookmark the permalink.